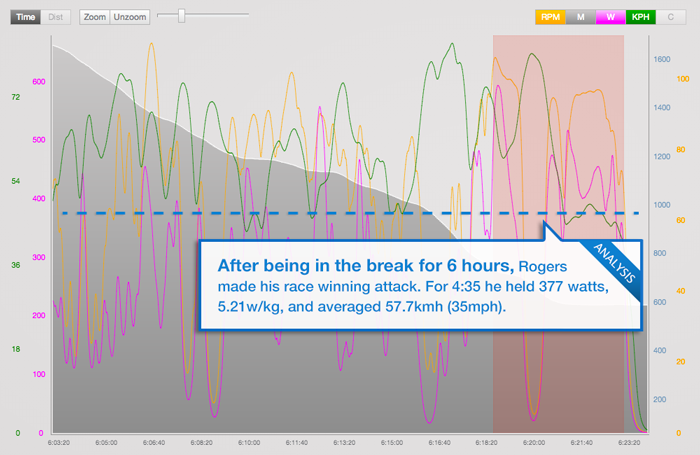 After being in the break for 6 hours, Rogers made his race winning attack. 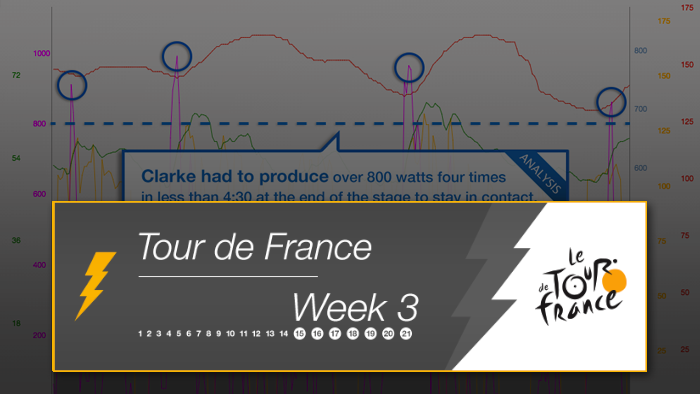 For 4:35 he held 377 watts, 5.21w/kg, and averaged 57.7kmh (35mph). Rogers’ peak 20 minute power came during the climb up the Porte de Balés where he held 441 watts, 6.09w/kg. During the entire climb Rogers held 428 watts, 5.91w/kg. for 35:16. To take the stage, Rogers had to burn 6,639 calories, climb 3,198m (9,594ft. ), and average 38.2kmh (23.6mph). View Pate’s full file here. The racing started early for Pate. His peak 1 hour power of 316 watts, 4.3w/kg, was set in the first 55km (34 miles) while climbing the Cat 1 Col du Portillion. Over this 4 hour stage Pate averaged 271 watts, burned 3,898 calories and averaged 82 rpm. With 3348m (10,137ft) of elevation gain, Pate’s average speed was 30.8kmh (19mph). 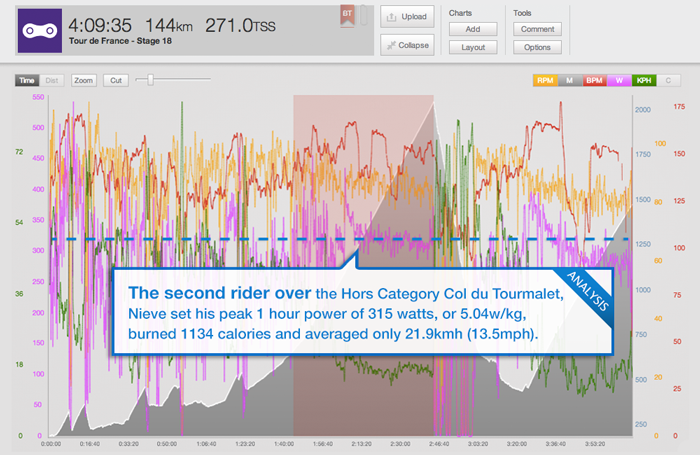 The second rider over the Hors Category Col du Tourmalet, Nieve set his peak 1 hour power of 315 watts, or 5.04w/kg. burned 1134 calories and averaged only 21.9kmh (13.5mph). To be in the early break, Nieve had to average 255 watts, 4.08w/kg., for just under 2 hours. Even after the Col du Tourmalet, Nieve was still able to produce his peak 10 minute power on the Hors Category climb to Hautacam. He averaged 350 watts, 5.6w/kg, with an average heart rate of 163. 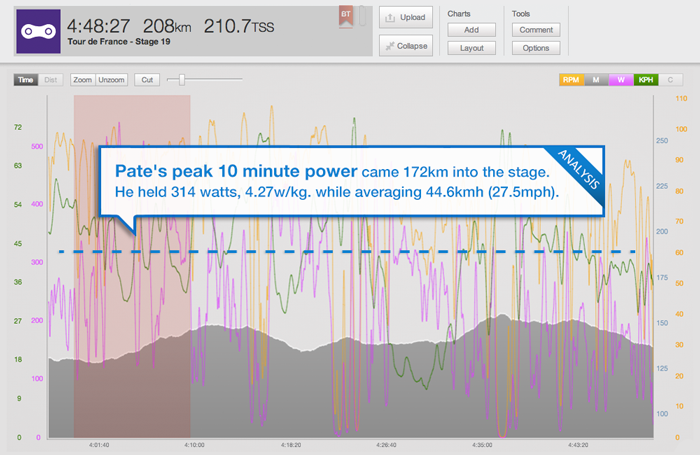 Pate’s peak 10 minute power came 172km into the stage. He held 314 watts, 4.27w/kg. while averaging 44.6kmh (27.5mph). 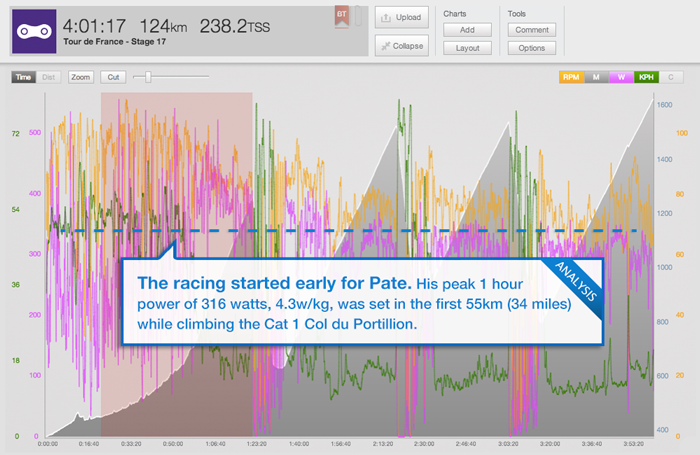 In the first hour, Pate had to produce his peak 1 minute wattage of 473 watts, 6.44w/kg. while cresting a short climb. At this effort, he was only averaging 29.5kmh (18mph). After his peak 1 minute effort uphill, Pate held his peak 1 minute speed of 72.2kmh (43.5mph) during a flat stretch. 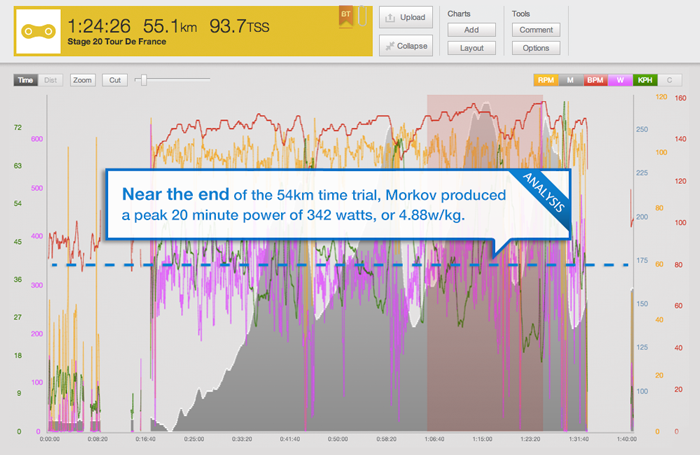 Near the end of the 54km time trial, Morkov produced a peak 20 minute power of 342 watts, or 4.88w/kg. To produce that effort, Morkov had an average cadence of 98rpm. Morkov’s Variability Index® was 1.04, indicating that he had a steady power output throught the stage. 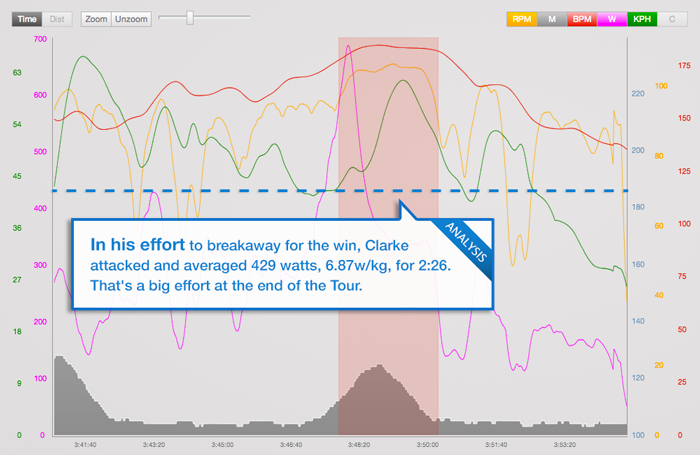 In his effort to breakaway for the win, Clarke attacked and averaged 429 watts, 6.87w/kg, for 2:26. That’s a big effort at the end of the Tour. During his effort, Clarke averaged 53.5kmh (33mph) with an average heart rate of 183bpm. Clarke produced his power and speed with an average cadence of 105rpm. View power analysis from week 1 and week 2.